Bleriots Guest House provides the perfect location for visitors that wish to have close and convenient access to Dover's White Cliffs. 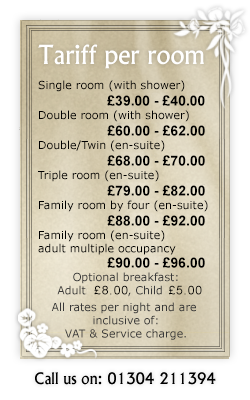 The accommodation is non-smoking and set in a Victorian Residence on a leafy tree lined avenue just over 1 mile away from Dover's White Cliffs. It is also very well located for visiting local restaurants and Dover Castle. The bed and breakfast has been awarded three gold stars by the AA and is highly commended for its comfort. A Few Comments From Our Guest Book! Gordon, Eve, Michael Kerman from Dundee Scotland - "Good Stay, Brilliant Breakfast"
J+R Fauler from Clare Ireland - "Lovely Breakfast, Friendly + Helpful. Thankyou"
M, JP + N Frei from Penthalaz Switzerland - "Lovely Place to Stay"
Sue & Dudley Sampson from Middlesex UK - "Great Ambience, Very welcoming, Great Breakfast"
C. Heptinstall from Australia - "Fantastic Host"
Daniel + Jena from Germany - "Very Nice stay thank you!" Emily, Eileen & Glenn Winter from USA - "Excellent Accomodation & breakfast, Very hospitable"